What comes to mind when you think of East Vancouver? For a growing number of people whether you are living in East Van, moving to the area or just visiting, the word ‘community’ is most often the first thing that comes to mind. Recent articles such as that in the Globe & Mail in March sets out why young people are leaving the West side. Yes affordability is one issue, but the other is a sense of community, knowing your neighbours and that feeling of belonging. There are, of course, many things that make East Van a great place in addition to community. There is also the culture, art, community based festivals, shopping, live music, the growing craft beer industry, the amazing selection of restaurants and coffee shops and the list goes on. So what we’d like to know now, is what does East Van mean to you in photos? East Van photographer Kyrani Kanavaros is compiling photographs taken around East Vancouver. Kyrani is a professional photographer living in East Vancouver with her husband and twin 8 year old boys. She has featured many local personalities, musicians as well as movers and shakers. What she loves is East Van and as many have said the sense of community she feels living in this area of Vancouver. 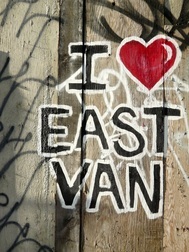 So what does East Van mean to you? We’d love to see your photos. Tag your photos on Instagram with #KlikEastVan or tag Kyrani on Instagram @Kyrani and well we won’t mind if you tag us Instagram @ILiveInEastVan. There are no right or wrong photos, this is not a photo contest, this is what means something to you. We look forward to seeing your pics.